2014 Press Pass Logan Thomas. Year: 2014. Serial Number: /199. Rookie: Yes. Product: Press Pass. Hand Signed: Yes. SKU: FT A0002 R01 V (22). Add to Favorites. All cards are in near mint/mint condition. DON'T MISS OUT ON THESE REAL SHARP LOOKING CARDS! FOR SALE IS THE EXACT CARD LISTED IN THE TITLE, AND PICTURED IN THE SCAN. CARD IS IN "NEAR MINT/MINT" ( /-) CONDITION, STRAIGHT FROM THE PACK, UNLESS OTHERWISE NOTED...SEE SCAN AND JUDGE THE CONDITION & CENTERING FOR YOURSELF. CHECK OUT OUR 100% FEEDBACK, AND BID WITH CONFIDENCE. FREE SHIPPING (USA ONLY) ON MOST OF THE THOUSANDS OF SINGLE CARDS IN OUR EBAY STORE, SO CHECK THEM OUT. GOOD LUCK, AND THANKS FOR LOOKING!!! CHECK OUT OUR OTHER AUCTIONS FOR MORE GREAT CARDS...ALL STARTING AT $0.99 WITH NO RESERVE! NOW OPEN......BAKENDAVE'S EBAY STORE!!! NEW ITEMS ADDED DAILY, SO KEEP CHECKING BACK!!! · Lone Star Sports Collectibles. Great item for any collector! You are bidding on a sweet 2014 Limited triple jersey of Larry Fitzgerald, Michael Floyd and Logan Thomas. See photos for condition. Winning bidders in the U.S. please add $3.00 S&H in a bubble envelope with tracking. Outside the U.S. will be shipped using eBay's Global Shipping Program. CHECK OUT MY OTHER AUCTIONS! FREE SHIPPING ON ADDITIONAL ITEMS! (Shipping combined at the highest shipping cost for any individual listing.) Check my feedback and bid with confidence. Any questions please do not hesitate to contact me. Thanks for looking! THE CARD NUMBER IS 13 AND IT IS IN EXCELLENT CONDITION. LOGAN THOMAS. CARD RJ - LT -# 18 / 25 SP. 1CLR GW ROOKIE JERSEY. INTERNATIONAL COST IS. WEIGHT & LOCATION. You will receive ALL cards in the picture(s). FOR SALE IS THE EXACT CARD LISTED IN THE TITLE, AND PICTURED IN THE SCAN. LOGAN THOMAS. 2014 Panini Prestige. Arizona Cardinals. I always strive to be both understanding and patient. Card is in MINT condition (see scan). 2014 Panini Rookies & Stars Rookie Materials Signatures #RM-LT- LoganThomas 208/299 ARIZONA CARDINALS Logan Lamont Thomas is an American football quarterback for the Miami Dolphins of the National Football League. He was drafted by the Arizona Cardinals in the fourth round of the 2014 NFL Draft. He played college football at Virginia Tech and was the Hokies' starting quarterback from 2011 to 2013. 2014 Flair Showcase #36 Logan Thomas RC Row 2 Virginia Tech Rookie Card! 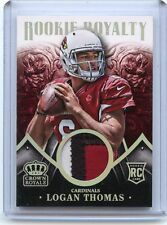 2014 Rookies & Stars #165 Logan Thomas RC Arizona Cardinals Rookie Card! LOGAN THOMAS AUTOGRAPHED ROOKIE CARD. 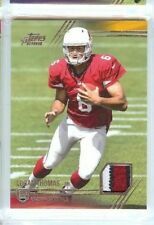 Rookie Royalty Materials #RR16 Logan Thomas 279/499. 2014 Crown Royale. Arizona Cardinals. 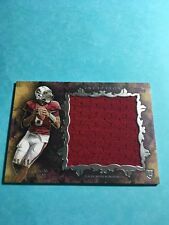 This is a Beautiful Magenta Rookie Relics Patch of Logan Thomas #44/50, Arizona Cardinals Quarterback out of 2014 Inception Football. Card is put in a penny sleeve, then a top loader and is secured in place by tape or a team bag. - Card # FSA-LTH. All requests to do so will be reported. Card Condition - NM-MT or better. Logan Thomas of the Arizona Cardinals. Misrepresentation of an item is exceedingly rare. Card Number: 108. Happy Buying. YOU WILL RECEIVE THE EXACT CARD LISTED IN THE TITLE, AND PICTURED IN THE SCAN. 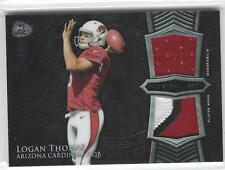 Nice dual patch of Logan Thomas. This is his rookie year. Nice memorabilia for any Arizona Cardinals fan. Fast shipping. Check out our store for more great cards. LOGAN THOMAS. 2014 Prestige GOLD Draft Picks Rookie Insert. 2014 Finest Atomic Die Cut Rookie Card. 2014 Rookie & Stars Rookie Card. ROOKIE LOT. Just request a total. This is for the item(s) pictured and listed in the title. You will receive the exact item shown. No stock images are ever used. If card appears out of a top loader, it was removed for the picture only and placed back into the top loader afterwards. Combined shipping is available at no cost to you up to 8oz. Please check out my other listings to take advantage of combined shipping. If you are unhappy with our transaction, please message me before leaving feedback. I want us to both walk away happy and will work to make it a pleasant experience.